Climate is defined as the avarage weather conditions at a specific place over a long period. The standard averaging period is 30 years. Weather is what the forecasters on the television news predict each day. Weather is elements which we see daily, such as temperature, rain and wind. These can change hour by hour, day by day. Climate on the other hand looks at how the weather changes over a long period of time, typically over 30 years. It can be thought of as the average weather over a long period. The difference between weather and climate is a measure of time. Weather is what conditions of the atmosphere are over a short period of time, and climate is the average weather in a place over many years. While the weather can change in just a few hours, climate takes hundreds, thousands, even millions of years to change. Scientists (e.g. 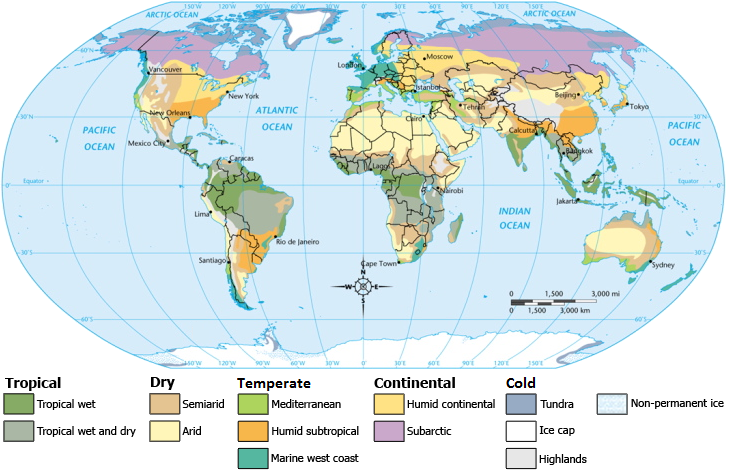 Wladimir Köppen) have been able to define climate zones around the world. Here in the Netherlands, we have a ‘temperate’ climate that is neither especially hot nor cold, wet nor dry, when compared to other climates. It is a very different climate to that in the Sahara for example, which is known as arid because throughout the year the weather is dry and hot. Wladimir Köppen (1846-1940), was a Russian-born German climatologist who developed a systematic method of classifying the climates of the world based on long-term patterns of the distribution of temperature and precipitation around 1900. His classification remains the most used climate classification system up to the present day. The distribution of vegetation is strongly correlated with climate patterns.